tv-ooh: tv we like to watch on the tv: Revenge: Which character needs the most psychological help do you think? Revenge: Which character needs the most psychological help do you think? Ah, the self-obsessed goings-on of a bunch of selfish but rich characters with an identity-swapping minx intent on revenge in the middle of it all. 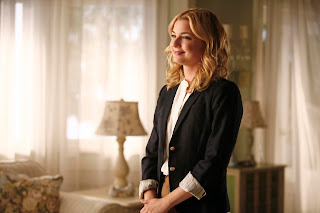 If you're not watching Revenge, E4 on Mondays at 9, you'll be unfamiliar with the brilliantly addictive nonsense of Emily Thorne's pursuit of vengeance against the family who framed her father for a crime he didn't commit. We're far too far into season one to recap in any great detail - and to do so would require a bit of Valium afterwards, frankly - but, in summary, Emily has fallen for the son, Daniel, of the couple she's trying to bring down - awkward - and the person whose identity she took while in a young offender institution has turned up and is wooing Emily's childhood friend, Jack. There's also a mysterious shooting at her beach engagement party, where everyone wore red and white, but we're still coming to terms with that. It is, all told, enough to send anyone into therapy, but who in Revenge would actually benefit from some talking time? Sammy the dog: He recognises Emily, who is of course really Amanda Clark - daughter of the framed David Clark - and Sammy's current owner's childhood friend from years before. Emily has now taken in Sammy while Jack planned to go off on a boat after having been drawn into Emily's web, thanks to the reappearance of the real Emily, who now calls herself Amanda Clark. Sammy is old (but doesn't look it), very confused, and a dog. That Japanese bloke: Emily's so-called mentor (we think this means he taught her some martial art moves on a beach one time), Takeda, is an 'investor' in the Grayson family business, and fears that Emily's revenge plot is at risk of failing due to her feelings for Daniel. What's it to him if she gives it up for love? Emily won't of course, it's not how she rolls - but maybe she should. She'll get her revenge, and then what? Make jam? Takeda also pretends to not speak English, but does so perfectly well with Emily - which is handy for the audience. He is probably not all he seems. Nolan: He lives in a huge glass mansion but with no curtains and doesn't really seem to do much other than wear polo shirts and white blazers. He has small video cameras in ornamental dolphins which have come in quite handy for the plot, seeing things he wouldn't otherwise have done, like Conrad's private detective getting heavy handed with Victoria's friend and Conrad's mistress Lydia. Nolan is always there to help Emily yet she plays him like a toy, when what he really needs is a cuddle (maybe from Jack) - and a haircut. Emily: Oh Emily, she has fooled everyone, to varying degrees, and has an icy stare, but you have to wonder how long her 'road map for revenge' is going to last, as the plot gets more and more complicated and the risk of her tying herself up in knots becomes ever greater. How does she keep up with it? Is she not a nervous breakdown waiting to happen? Did Takeda cover that in her training? Is there anything in that box she keeps under her floorboards to help with the anxiety? A bumper bottle of Rescue Remedy perhaps? The only person she is even remotely straight with is Nolan - who himself needs a cuddle (see above) - while her old friend Amanda has been let in on her secret too, but only out of necessity. She's fallen for Daniel, his sister Charlotte is Emily's half-sister, but she also wants to exact revenge on his parents. You wouldn't want to be at their house at Christmas. Charlotte: Papa Grayson - we want to call him Larry - dissuades his granddaughter Charlotte (not actually his son's biological daughter) from taking therapy as he doesn't want the risk of the family's secrets being exposed in case it harms their business, Grayson Global. One day she'll explain all this to a shrink. Victoria: Charlotte's mother, and Emily's father's former secret lover, socialite Victoria Grayson, has actually had some therapy - but only for a specific aim: she bribed the therapist in return for her ensuring that Emily, back when she was in the care of the state as a child, was sent away. So she probably needs some more. She should also invest in some slippers - wearing those smart shoes all the time, even indoors, is going to hurt even more than all that emotional torment. The entire audience watching: If you're keeping up with Revenge, and you're following the many twists and turns, you're doing well. You probably won't need psychological help, but you do need to be careful that any 'road maps to revenge' you might be inspired to take, having watched Emily, don't become so consuming they inform your ever waking moment. Yeah don't do that - take a holiday. Summary: All the characters need therapy, but not until the programme ends otherwise it might ruin our enjoyment. Revenge creator Mike Kelley has apparently said he has enough story for three seasons of the show: the second is due in the US autumn 2012, and the third would be expected next year. Good grief. That prospect makes us both thrilled and terrified.